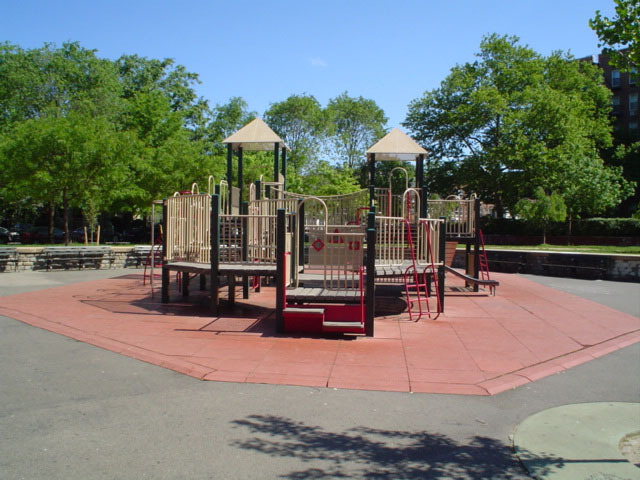 This playground, located at 92nd Street and 56th Avenue, takes its name from one of the oldest European settlements in Queens. Eight years after the abandonment of the Maspeth colony in 1644, English colonists moved inland to what is now Queens Boulevard and Broadway in 1652. The land for the new colony was formally obtained from three Native Americans named Rocero, Westcoe, and Pomwamken by English Governor Richard Nicolls in 1666 for 71 pounds and 9 shillings. Although the Dutch called this location Middelburgh, the English settlers described it as the “new town”—as opposed to the first colony at Maspeth. When the English system of towns and counties was introduced in 1683, the community was designated as Newtown. Newtown lent its name most prominently to an apple and a waterway. The Newtown Pippin originated on the estate of Gershom Moore (now the Clement Clarke Moore Homestead) early in the 18th century. By the 1750s and 1760s, the sweet, tart, crisp and tender apples were grown in numerous Virginian orchards and were imported to Europe by Benjamin Franklin when he was in London. Proudly comparing the qualities of European and American fruits, Thomas Jefferson wrote, “They have no apples here to compare with our Newtown pippin.” The green-skinned, yellow-fleshed Pippin has a citrus-like or piney aroma and keeps well despite shipping. A tributary of the East River, Newtown Creek forms the boundary between Brooklyn and Queens. The creek was used by the first colonists in Queens and by British soldiers who spent a winter there during the American Revolution. Over the course of the 19th century, the creek became a popular shipping route and a dumping place for sewage and industrial waste. It was so foul and polluted that when real estate magnate Cord Meyer Jr. developed property just north of Newtown in 1895-96, he successfully lobbied the U.S. Postmaster General to change the town’s name to Elmhurst. He hoped to disassociate the area from the noxious odors of Newtown Creek. 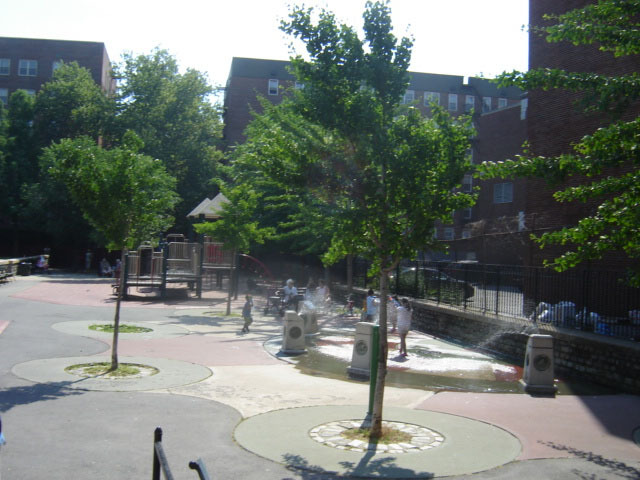 As early as 1730, the site of this playground was used as a cemetery and later served as a potter’s field. Some of Newtown’s most prominent residents were buried here, including members of the Moore and Fish families, who were successful fruit growers and farmers. This public space was acquired by the City of New York by consolidation on January 1, 1898, and transferred to the Department of Parks in 1917. It was not developed as a playground until 1934-35. The playground opened on August 9, 1935 with slides, swings, sandbox, seesaws, benches, comfort station, tool house, and cherry and hawthorn trees. 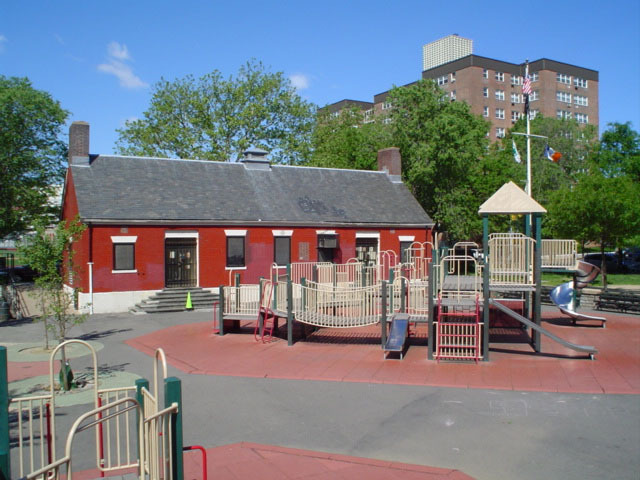 In 1997, with funding from Council Member John D. Sabini, Parks began the reconstruction of Newtown Playground and Park House. The redesign of the park enhanced and updated the facilities for contemporary park users and students at the preschool which is located in the Park House. Improvements to the playground included new play equipment, benches, paving, and landscaping. Open lawn areas were created over archeologically sensitive areas, and the original cemetery wall was reconstructed with traditional materials. A ring of weeping cherry and beech trees was planted to memorialize the mostly anonymous townspeople still buried in Newtown Cemetery.